The clearing of half finished models from the painting desk before the close of 2014 continues. 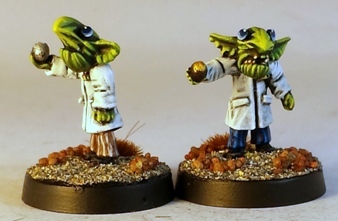 Treading the line between Dr. Bunsen Honeydew and some mogwai fed after midnight are these Brainboyz, ready to lead ork armies into a more intellectual era. 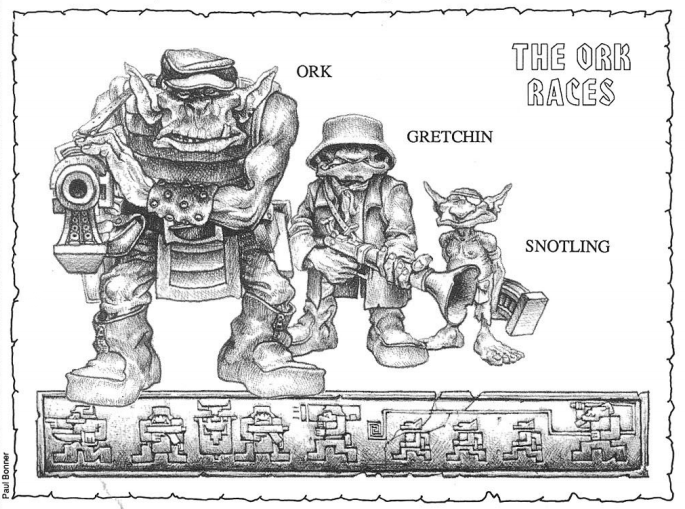 In 1990/91 the background to the Orkoids (orks, goblins and snotlings) in the Warhammer 40,000: Rogue Trader setting was fleshed out via three books: Waaargh the Orks!, ‘Ere We Go and Freebooters. Core to this exploration was the definition of the orks as a genetically engineered race: the orks were created by the Brainboyz. 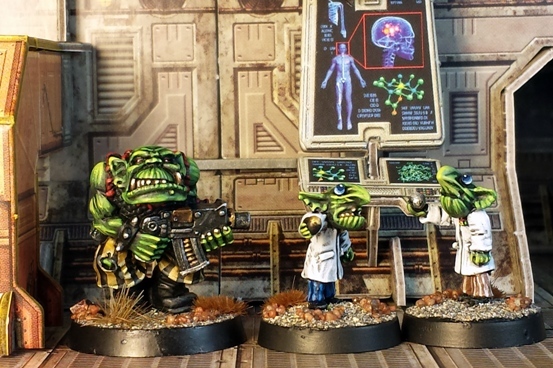 The Brainboyz were the original orkoids – snotlings – that had their mental abilities (and therefore culture) boosted by symbiotic, brain enhancing fungus. The Brainboyz genetically manipulated their own biological make up to generate a warrior caste (orks) and a servant caste (or possibly intermediate warrior class, gretchin) of essentially the same species. 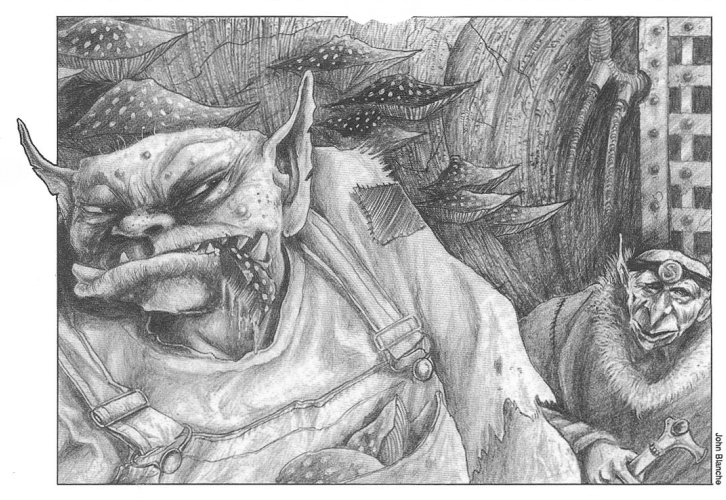 Then something bad happened, the Brainboyz ran out of fungus and reverted to snotlings over a generation or so and the orks took over and have been in charge ever since. 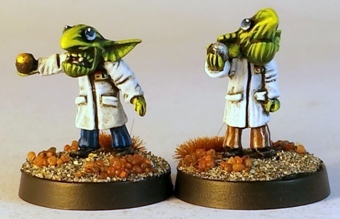 I picked up a few 15mm miniatures with separate heads from CP Models earlier in the year, with the intention of using them as small alien scientists in 28mm. Then while digging round in my box of ork parts for another project I found some gnoblar heads and had an idea and suddenly these models happened. The gnoblar heads look quite large when attached to the scientist bodies, but as that look fits well with the idea of the expanded mental faculties of the Brainboyz, I went with it. I also added slices of styrene rod to function as some sort of sci-fi, vaguely Morpheus-from-The-Matrix spectacles, cos, y’know, nerdy scientist types always wear glasses. I am perpetuating a stereotype. The Brainboyz generate far more ideas for gaming than I initially expected that they would. These little guys could somehow be the remnants of the original Brainboyz civilisation or they could be “modern” snotlings who have come across another source of the original brain enhancing fungus/another artificial brain enhancing substitute. 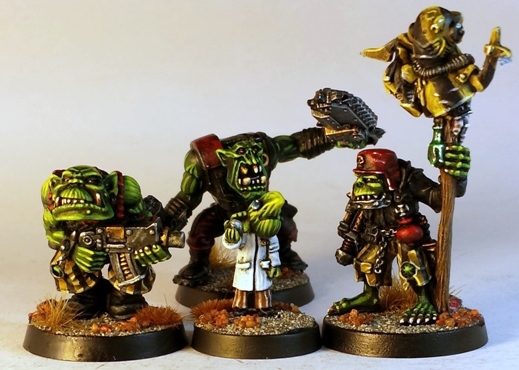 The idea of a game where the orks are actually led by these guys appeals to me quite a bit. 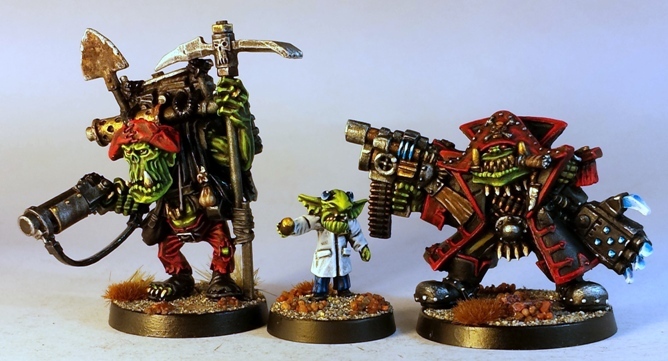 Im not sure that the average ork would simply bow down and accept orders from name badge and lab coat wearing, tiny, geeky greenskins, but I presume that the original Brainboyz had similar issues and found ways to deal with them. My favoured approach would be to assume that the Brainboyz themselves have been engineered to exude some sort of pheromone/spore that renders the orks compliant with their demands. Alternatively, maybe the spheres that the Brainboys are carrying (the original models are supplied with a not-Ood head, so I am guessing that the spheres represent those things) are some sort of device that forces orks to do the Brainboyz bidding. Plenty of options, all of which amuse me. Cute! Or perhaps sinister in a Brain from Pinky and the Brain way? They look fully at home in their lab setting, and clearly have no concept that their big burly slaves might pose a threat to them (why would they? They’re the superior beings!). Hopefully an uncomfortable blend of cute and sinister as you noted. A slightly detached from reality, institutionalised academic vibe is what I was hoping for. I would have given them elbow patches if they hadnt had lab coats on. Science for science sake, leave the consequences to the philosophers… or the genetically engineered warrior race that will revolt and colonise the galaxy like a plague. Output has been slow since August (these models and the previous Klöwd models from the other day were originally slated for the trip to BOYL in fact), so it is satisfying to be tying up a few loose ends before 2015 kicks off. They are pretty funny aren’t they? Wow, another piece of genius. I love how you came to this idea. In fact I can think about a couple of scenarios having those as centrepieces. Great work! Thanks Suber. The Brainboyz were a simple project, but they turned out to be quite amusing little figures. I will definitely hinge a few games around the little guys. That is such a cool idea and what a great way to set up an ork on ork scenario! Is it ok to “borrow” this idea in the new year? Feel free to borrow all you want (and its not like I could stop you anyway 🙂 ). If you do get a game using Brainboyz in then it would be great if you could report back with photos. The pick axe guy is actually a prospector type from Gorkamorka, a character model called Nazgrub Wurrzag (spelling varies). Its a great sculpt, one of Brian Nelsons earlier ones for GW. The blog post about my Nazgrub is here. Thanks for the feedback on the Brainboyz. I am looking forward to getting some games in with them. Happy New Year. Amazing, you never run out of ideas.